These Sculpting form have been devised for a head of approx. 22" - 55 cm large rebornbaby. Our form saves you both clay and time and also enhances realism! The life-like look is perfected through proper facial feature placement. It's time to move beyond balls of aluminum foil and start benefiting from an armature designed specifically for baby sculptors. You will achieve the very best results when you learn the secrets revealed in our Sculpting Training DVD. Training in this unique time-saving method of sculpting is not taught anywhere else in the world! Our DVD shows you step by step how to use the Secrist sculpting form to make an incredibly life-like baby head using only one pound of clay and finishing it in a fraction of the time it normally takes even the most experienced sculptors. When you are finished sculpting the head you do not remove the form. It is cooked right inside the head! The only way to remove it would be to destroy the head. The form is much like a skeleton and is permanent. When using Super Sculpey bake the finished sculpt for 15 minutes at 275 degrees Fahrenheit (135 C). Time and temperature may change depending on stove and age of clay. Always refer to the manufacturer's box for exact baking instructions. Be sure to use full-round Blank Eyes in your sculpting form to make the most life-like sleeping baby. The full-round eyes behind the eyelids perfectly re-create the round and puffy effect of a real babies eyelids in the closed position. The Art of Sculpting DVD. 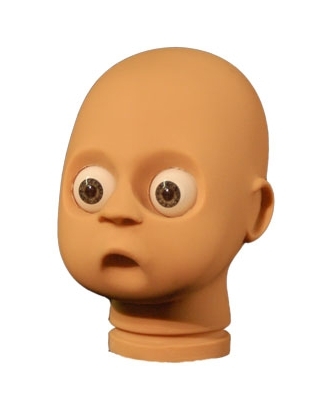 The large form is designed to create a baby head for a 22 inch-55 cm rebornbaby. Uses size 22 mm full-round eyes, sold separately.